The Conversation is exactly what it sounds like: two or more Dissolve staffers chatting about a specific film or film-related topic, and inviting readers to come weigh in. Tasha: One of the many daring things I respected about Catching Fire is the way it launches straight into the story, as if the audience for the previous film has just flipped a page and started the next chapter. There’s no opening crawl setting the scene. No voiceover with Katniss saying “It’s been nearly a year since the Hunger Games, and I still have really bad post-traumatic stress disorder about it.” No awkward expository Thor: The Dark World-style conversations with Katniss telling Gale, “As you know, Peeta and I won the previous Hunger Games by threatening to commit joint suicide and becoming martyrs on behalf of our entire country,” and Gale answering, “I remember that, and also that your mentor Haymitch was a worthless drunk who rallied in order to help you when you needed it most.” Instead, director Francis Lawrence and writers Simon Beaufoy and Michael DeBruyn open by indicating things are back to normal—Katniss and Gale are hunting together in the woods, competently and peacefully—and then immediately showing how things are no longer normal. Katniss can’t bag a turkey without seeing it as a fellow Hunger Games tribute. She has panic attacks. She and Gale apparently haven’t talked about their relationship at all. Time has passed, but nothing has settled. There are so many things just in that opening that make Catching Fire a better movie than The Hunger Games. 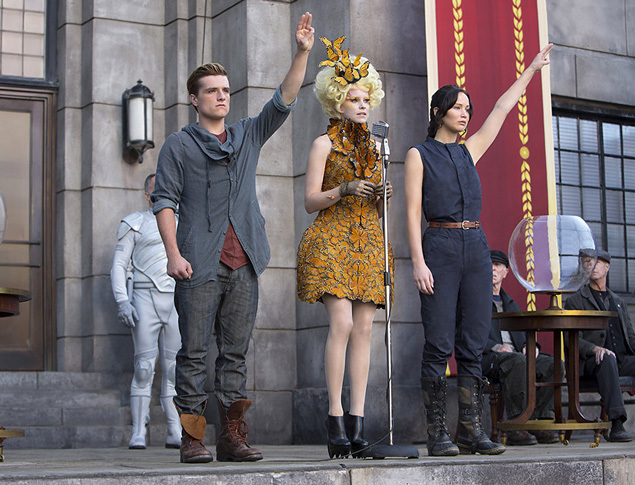 Catching Fire isn’t nearly as burdened with introductions and setup. The filmmakers—a completely different writing-directing team than the one that tackled the first movie—move the story along briskly: This is one of the quickest-moving 146-minute movies I’ve ever seen. This film has the advantage of starting with the characters’ situation already dangerous and tenuous, so the tension level is high from the beginning. But most significantly, the filmmaking team trusts the audience to be invested already, to know what’s going on, and to keep up with the action. Most of my quibbles with the film come from the way any subtext has to be spelled out with blunt, straightforward dialogue, but at least the film doesn’t linger on these ideas, or repeat them. Once a feeling or idea or motivation is on the table, the film just keeps moving past it. Was that your experience, guys? We all left the theater agreeing that Catching Fire was a significantly better film than The Hunger Games. Do you have more reasons why? Scott: It seems to me, Tasha, that franchises like The Hunger Games, which tell a complete story in installments, have largely gotten past the “previously on” hand-holding to jump right into the action, so I’m less inclined to give Catching Fire credit for that. (Though that first scene with President Snow—and the hologram footage of the berry suspenseful finale of the 74th games—offers an elegant primer.) But still, from the very first series of shots in the film, it was clear to me that we were in the hands of a much stronger and more confident director. Francis Lawrence isn’t a brilliant auteur by any means: I Am Legend is a better film than Water For Elephants, but both cases suggest the safe choice of a filmmaker more content to deliver on a franchise than to knock people out with his directorial bravado. Hiring him was more about maintaining continuity than serious course-correction, and I’ll admit to dreading that prudence upfront, because I like my blockbusters to have a little personality. I’d compare Catching Fire to Alfonso Cuarón taking over for Chris Columbus on the third Harry Potter movie. Francis Lawrence’s contributions aren’t as dramatic, but like Cuarón, he had to respect the franchise’s continuity rather than enjoying the freedom of working without a template. And like Cuarón, he gave it an undeniable boost both in terms of production values, which seem much higher this time out, and dramatic urgency. The Reaping was by far my favorite scene in the first Hunger Games, and one where Gary Ross’ handheld aesthetic paid off in grounding this grim ritual in a world that resembles West Virginia coal country. But it doesn’t have anything like the force of a similar scene in Catching Fire where Katniss and Peeta, on their government-mandated “Victory Tour,” improvise their way through a speech before Rue’s home in District 11. But really, the upgrades are apparent everywhere. The Gamemaker from the first movie was Wes Bentley; here, it’s Philip Seymour Hoffman. It’s almost unfair. Genevieve: The production value didn’t just seem higher this time out, Scott. Catching Fire was working with a budget almost double that of The Hunger Games, which wasn’t exactly a microbudget indie to begin with. (The perks of being successor to the third-highest-grossing film of 2012.) It feels a little wrong to dwell on the look of the film too much, given how the themes of luxury and superficiality play into the rebellion that drives this film’s narrative (and will presumably drive the next two films to an even greater extent), but I admit to getting a little swept up in the glitz and glamor of the first half of the movie, when Katniss and Peeta are trying to play good little Capitol pawns. Those who have read the books these films are based on know Suzanne Collins devotes a lot of energy to describing the outré-bordering-on-garish fashion trends of the lucky few who happen to live in Panem’s richest, most oblivious district, and while production designer Philip Messina made some decent strides toward realizing her vision of Panem in the first Hunger Games movie, Catching Fire actually makes Panem seem like a substantially different world, rather than just a movie version of our world with slightly sillier clothes. I could look—and laugh—all day at the sartorial confections of Elizabeth Banks’ Effie Trinket, which serve as a reliable visual punchline in every scene in which they appear, particularly when contrasted with Katniss and Peeta’s District 12-approved fashions (which I can only describe as “futuristic knitwear”). But the improved production design goes beyond just the wardrobe. (Which, did I mention: SO PRETTY, you guys!) One of my favorite touches in Catching Fire was the look of the deserted Victors’ Village, the District 12 subdivision of luxurious Capitol-constructed homes intended for Hunger Games winners—that is, Katniss, Peeta, Haymitch, and no one else. The way the District 12 residents’ gloomy, sparse, snow-dusted gray aesthetic mingles with the Capitol’s assumptions of what they want in a home struck me as very thoughtful, and served to highlight the disconnect between powerful and powerless that drives this story. I also loved the visual of Katniss and Peeta emerging from their homes to meet in the deserted square between their homes, wearing pasted-on smiles and waving for two ambulatory cameras, but no actual people. All of this falls within the first hour or so of Catching Fire; I haven’t even touched on the Games themselves, and particularly the new death-clock arena, which I think improves dramatically on the first film—not just the look of it, but the way it functions as a character in the story, a living, breathing, killing extension of The Capitol’s malevolence. How do you guys feel about it, and how do you think Catching Fire functions as an exciting action movie? Tasha: I wasn’t as struck as you were by the arena, Genevieve, in part because I didn’t see it as an extension of The Capitol’s malevolence so much as an embodiment of the tricky game Plutarch Heavensbee (oh, those ridiculous names) was playing with President Snow. Catching Fire the film is less married to Katniss’ point of view than the book, which means the audience gets to see Plutarch and Snow alone together. It seemed clear to me from their conversations that Plutarch is a cautious man who says the right things to Snow, but doesn’t evince the glee at killing off kids that someone in his sadistic position ought to have—the film tips his hand more than the book did, while still playing careful and coy with the audience. The arena seems like an emblem of the double game he’s playing: It’s lethal, but to a smart Hunger Games tribute who figures out the pattern, it’s also mighty predictable, with patterns that can be sussed out to make survival easier. The clock idea seems like a gift to Katniss—“If you guys can solve this puzzle, you’ll know exactly where to go to avoid any danger”—while still maintaining the pretense that Plutarch is looking for a chance to kill her. It’s clever, and it’s dual-natured, but I didn’t find its apes and floods and blood as frightening or intense as the first Hunger Games, because it always felt like Plutarch was holding back. Still, Jennifer Lawrence does a fantastic job of capturing Katniss’ first moment in the arena, when she’s reeling from witnessing Cinna’s beating and arrest, and she has only seconds to fight back her emotions, take in the environment around her, and act. The whirling camera and blurred surroundings in that moment really capture the vertigo of being thrust into a strange environment, and the absolute necessity of analyzing everything at once. And his action sequences overall are tight and evocative, but comprehensible, with a clear sense of space and the participants—except in a few deliberate moments where Katniss herself can’t keep track of either. One of the things I most appreciate about Catching Fire—my favorite of the books by far—is that Katniss so often doesn’t know what’s really going on. Young-adult fiction often plays up protagonists’ vulnerability by making them teenage girls, and making them young, naïve, and handicapped by circumstance. They’re often unaware of their own supernatural natures, or family connections, or abilities, or the histories of the societies they’re living in, or whatever else would be key to making them settled and confident in their skins. Whatever they’re most missing, they have to discover on their own, both for themselves and for the readers. Catching Fire follows that same kind of course. The audience knows Katniss is smart, tough, and determined to survive, but also that she’s utterly overmatched. She isn’t just fighting an entire corrupt, oppressive system, plus her own trauma and reluctance to be a messiah; she’s up against her ignorance of the conspiracy that’s helping her. She thinks she’s completely alone. And while Catching Fire the movie steps outside her perspective, it never fully lets up on her isolation, or on the sense of the overwhelming forces arrayed against her. While her actions at home and in the arena are sparking revolution, the audience sees virtually none of it. It’s a daring story choice that really helps the movie: It would be so easy for Francis Lawrence to cut between Katniss and Peeta in the arena, and the non-Capitol viewers watching her, being inspired, and taking action. Instead, the focus is on her immediate survival, not the larger picture that might give her death larger meaning and make her martyrdom “acceptable” in movie terms. That narrow focus strikes me as contributing far more to Catching Fire’s breathlessness, intensity, and desperation than the nature of the arena does. Scott: As Tasha describes well above, in the books and the films, Katniss is tough, resourceful, and a survivor, but not really a plotter, and not one who likes to think about the big picture, or what her role in that picture might be. It’s a source of confusion for her—not knowing, say, whether Peeta’s feelings for her can be trusted, or even whether she can be sure of her own feelings for him—and she resists her destiny as the symbolic Mockingjay of the revolution, even as Cinna literally outfits her for the part. She’s an utterly guileless heroine, and Jennifer Lawrence continues to play her perfectly: As someone who’s genuine, empathetic, and occasionally fierce in her reaction to events, but never entirely in control of the games being played around her by Peeta, Haymitch, Plutarch, and the like. She can be brilliant in the moment, like when she threatens to eat those poison berries, but she’s generally being kicked around by friend and foe alike. If anything, the films, especially Catching Fire, do a better job than the books at keeping her from seeming dim or weak as a consequence. I also appreciated the arena more this time around, partly because Lawrence (with his enhanced budget) renders it more dynamically, and partly because its parameters are more heavily dictated by the Capitol and the Gamemakers. If The Hunger Games trilogy (or tetralogy, as the films have made them) is about a heroine who struggles to gain control over her own destiny, then the arena in Catching Fire is a perfect reflection of that—mechanized to the ticking of a clock, with perils owed more to The Man than the savagery of the participants. (It was also nice, frankly, to not have to consider how children killing children in an arena of death could be cleaned up for a YA audience or a PG-13 rating.) One question I have for you two, though: Do The Hunger Games strike you as a particularly smart way to keep the masses at bay? Collins is referencing the bread and circuses used to appease the hoi polloi (Panem derives from the Latin phrase for “bread and circuses,” as it happens), but distracting the people in the Districts by punitively slaughtering their children seems like a losing strategy to me. It may seem like a weird thing to complain about, but when Snow and Plutarch are figuring out how to stamp out the revolution through the Quarter Quell, it seems obvious the solution they arrive upon will backfire. 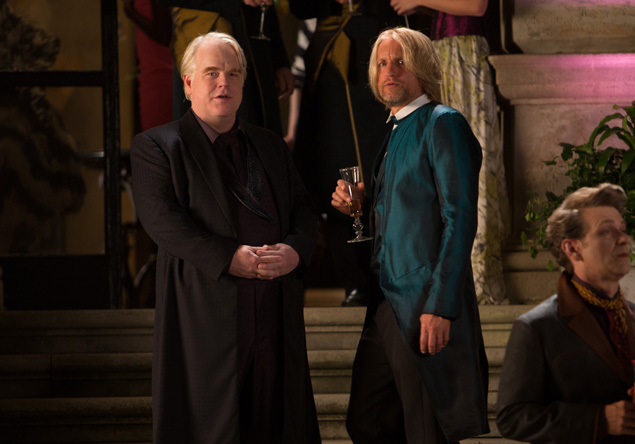 Or maybe that’s Plutarch manipulating Snow. Genevieve: Well, The Hunger Games are meant to serve as a distraction only for those living in the districts that afford them the time and luxury for distraction, and who have a twisted enough sense of entitlement and human decency to interpret winning the games as an honor. Districts 1 and 2 are, in the book and film, where the highly trained, ruthless “Career” tributes inevitably come from. (Having just rewatched the first film, I noticed a small moment relating to this that I thought was handled particularly elegantly, where a wealthy, happy Capitol family gifts their excited children with toy swords, while Katniss looks on dubiously.) But for the rest of Panem, it’s meant as penance, as laid out in the “Treaty Of Treason,” the text of which opens the first film: “In penance for their uprising, each district shall offer up a male and female between the ages of 12 and 18… Henceforth and forevermore this pageant shall be known as The Hunger Games.” So while pageantry is invoked right there in the Games’ governing document, it’s intended more as an elaborate form of punishment than entertainment. Frankly, given that, I find it more dubious that it’s taken 75 years of this for another uprising to form in response to this document than that the government has dressed The Hunger Games up like the Olympics on steroids in order to distract the populace from their real intent. We’ve spent a lot of time talking about Catching Fire’s strengths, but while we unanimously agree it’s an improvement on The Hunger Games, it’s by no means a perfect film, or a perfect adaptation. So now, it’s quibble time! Personally, I continue to be irked by the mishandling of Lenny Kravitz’s character, Cinna, whose role was winnowed down to maybe three scenes total in Catching Fire. Some of that is simply a matter of narrative compression, sure, but Katniss and Cinna’s relationship is a very important one in the books, and it feels like it’s been cut down to almost nothing, due in part, I imagine, to Kravitz’s lifeless performance. Cinna is meant to be the one person in the Capitol, or maybe anywhere, that Katniss feels she can trust, but in the films, he comes off as little more than the dude with gold eyeliner who makes her crazy dresses, which undermines that big moment as Katniss is rising into the arena when he’s taken by Peacekeepers. As Tasha says, Jennifer Lawrence does a great job selling that moment when she first enters the arena, but she has to work more to sell it than she would have if Cinna had been established as a character worth reeling over. Like I said, his part has been slimmed down to such an extent that it’s hard to get too worked up about Kravitz’s performance, or lack thereof, but it does feel like a wasted opportunity. What about you guys? Air those grievances! That said, most of the other negatives I can think of about the movie feel petty, especially next to the many small things I loved. Like the shape of the ending, which I’m considering writing significantly more about. Or Katniss’ startling, effective presentation makeup—her stylists’ attempts to make her look like a fierce, raptor-esque icon are startlingly effective at rendering Jennifer Lawrence unrecognizable, and convincingly inhuman. Or Lynn Cohen’s sweet, compelling performance as Mags. A mute role in a bombastic movie is a difficult thing to pull off without getting lost, but Cohen is convincing as someone who’d prompt people to fervent love and loyalty. Overall, in this outing, it seemed as though the filmmakers cared more about the little details, about crafting a compelling audience experience, and about the characters as people. Scott: Misgivings? My main issue with The Hunger Games overall—and this goes back to the books—is that I’m not convinced it’s that pointed an allegory. There are references to ancient Rome and Nuremberg, and the decadence of totalitarian governments throughout history, but it never sharpens to a point. It feels like a generalized dystopia rather than one with specific resonances. In other words, I think there’s a ceiling on how much I can like a Hunger Games movie, and I credit Catching Fire for coming close to where I suspect that ceiling to be. I don’t think Collins is that committed to the politics of her books, and the films have by and large followed suit. It’s all a big metaphor for whatevs. My other complaint is that the love triangle still doesn’t hold much interest, partly because Josh Hutcherson seems like the CW choice for Peeta (slight, pretty, not terribly soulful), and partly because Gale continues to be buried deep in the supporting cast. He’s literally not in the game, so the only time we spend with him are in those fleeting moments when Katniss is back slinging arrows in the District 12 forest. There are some big emotional scenes in Catching Fire—like the great scene in Rue’s district, which I mentioned before—but the romance (or faux-mance) still doesn’t register for me. And I’ll say this much about Lenny Kravitz: I was disappointed Cinna’s fate was ambiguous. He may not have been killed, but he’s a scene-killer. Genevieve: While I agree with you, Scott, that the love triangle suffers from Gale not being around much, I do think the Hunger Games romance element is, as these things go, more interesting than most. As I noted in my review, I like that it’s rooted in motivations more complicated than “I have a crush on evvvery boy!,” and that Katniss herself seems less interested in which boy likes her than she is in staying alive and keeping her family safe. Certainly some of this perception comes from time spent with the books, which flesh out this three-way relationship more fully, but I think this film in particular does a good job of highlighting Katniss’ discomfort with using Peeta as a pawn in Snow’s game, and the combination of loyalty and affection she has for both of them, for very different reasons. These relationships are going to get more prominent, and much stickier, in the upcoming final films, so I appreciate that Catching Fire is doing its due diligence laying the groundwork for that—like the scenes of Gale getting whipped in the Square, and Katniss’ family caring for him afterward—even if it does result in a few oh-so-standard shots of Gale looking sad/forlorn/angry from afar while Katniss and Peeta are in the arena. Despite our various minor quibbles and preferences for certain elements, though, we all agree that this is a major step forward for the Hunger Games franchise, an improvement I think is equally attributable to the new creative team and the source material (which, I agree with you, Tasha, is the strongest of Collins’ three books). It will be interesting to see how that balance shakes out in the upcoming Mockingjay films, which maintain Francis Lawrence as a director, but are being penned by Lee Daniels’ The Butler scribe Danny Strong, replacing Beaufoy and DeBruyn. Given that Mockingjay exists in a much different, much darker milieu than the first two films, and is being stretched over what is, to my mind, an unreasonable length, Strong and Lawrence have their work cut out for them. But at this point, and with momentum on their side—the two films are set for 2014 and 2015 release dates—it seems like the odds are in their favor.